Of course we love it the most when customers stop in to Gus’s, so we can see your smiling faces and direct you exactly where you need to go (and maybe make suggestions of things you’ll like). However, we also know that we live in the age of consumer convenience, so we started building a mobile grocery store and a process of ringing doorbells with a giant poking device. We thought we might just go door to door, offering groceries. Luckily, before we got too far along in this endeavor, we found out about Instacart. Have you heard of Instacart? If you haven’t, that’s great, because we have a great deal for first time Instacart users. $10 off + free delivery on a customer’s first order (order must meet minimum of $35). Just use the coupon code “10gussmarket” when you sign up here. 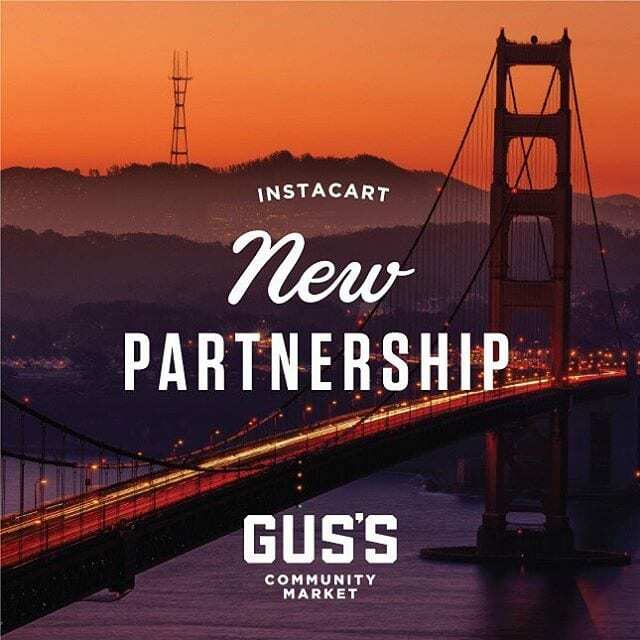 Using Instacart to get choice products from Gus’s couldn’t be simpler. Download the app, search for the things you want, and add them to your shopping cart. Choose your delivery window, and your food arrives when you desire. Like magic. As usual, that’s Gus’s, working tirelessly to make your life better. If there’s any other way to be, we don’t want to know about it.